The Drive Map in the main program window is a visual tool for displaying how files are arranged on your hard drive. 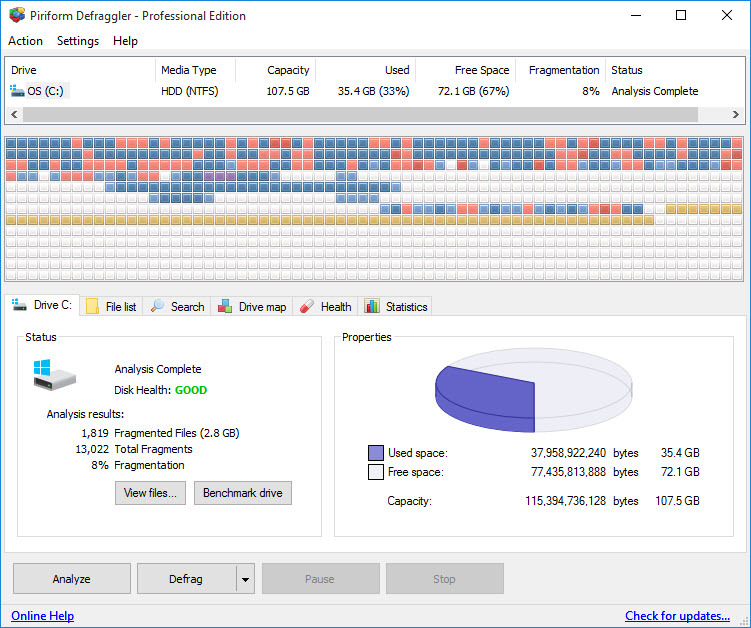 You can see at a glance how fragmented your drive is, and where files tend to be located. Each square in the Drive Map represents a section of your hard drive. The size in KB (kilobytes) or MB (megabytes) of the section displayed depends on the size of the drive; the bigger your drive, the larger the storage area represented by each colored square. The order of the squares is the same as the order of sections of your hard drive - the square in the upper-left represents the first section of the drive. Defrag Highlighted - Defragments the file you've highlighted. Check Highlighted - Selects the check box or boxes for the highlighted file or files. Uncheck Highlighted - Clears the check box or boxes for the highlighted file or files. Highlight Folder - Selects all files in the folder containing the selected file. You can use the submenu to select folders which contain the folder where the file is located. Open Containing Folder - Displays the file in Windows Explorer. Save List to a Text File - Saves the names and details of all of the files in the File List to a TXT file. You can highlight multiple files to work with them, or you can use the check boxes to select multiple files. If you use check boxes, you can right-clicking the file or files and select Defrag Checked to defragment all of them. To return to the drive map view, single-click on the same square. White Empty There is no data in this section of the hard drive. This section is not fragmented. Red Fragmented This section is fragmented. Files using this section are also using other sections to store other file parts. The page file (or swap file) is a space on the hard drive which Windows uses as an extension of its real memory (RAM). While Windows is running, you cannot defragment this section of the hard drive. This section is reserved for the Master File Table (MFT), which is a database that stores information about every file and folder on this hard drive. The MFT is used for NTFS-formatted drives only. Defraggler can defragment the MFT as well, but it cannot move the MFT's starting position. When Defraggler is defragging a drive, you will see sections flash yellow as it works. This indicates it is reading files from that section. Similarly, when Defraggler is defragging a drive, sections will flash green as it is writing files to them. If a square is heavily fragmented, it will be dark red; if it's lightly fragmented, then it will be light red. Similarly, if an unfragmented square is mostly full of data, it will be dark blue. If an unfragmented square is mostly empty, it will be paler blue. You can keep the Drive Map legend open while you work with Defraggler.